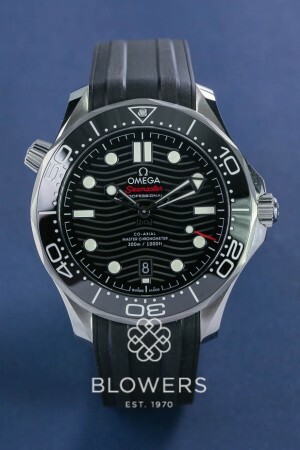 Omega Seamaster Diver 300m 210.32.42.20.01.001. 42mm steel case which is water resistant to 300 meters. Automatic Omega 8800 caliber Co Axial movement. Power reserve of 55 hours. Black ceramic dial laser-engraved waves and luminous dot hour markers. Uni-directional Black ceramic bezel. Date display at the 6 o’clock position. Black rubber strap with steel buckle. Box and papers dated January 2019. Pre-Owned Unworn. SKU: 3013690. Categories: Omega, Seamaster.